The Liberal government is providing $50 million to Quebec, Ontario and Manitoba to help ease a housing crunch caused by an influx of asylum seekers. Immigration Minister Ahmed Hussen made the announcement on Parliament Hill today, saying the money is just a first instalment in a longer-term funding arrangement. Quebec will receive the biggest share of the funding — $36 million — while $11 million will go to Ontario and $3 million to Manitoba. "This is an initial help for immediate needs to meet the requirements for temporary housing, shelter capacity this summer," Hussen said. Talks with the provinces and the cities of Toronto and Montreal, which have seen the largest numbers of asylum seekers, are ongoing. Hussen said a triage system is being developed that would aim to funnel people away from the major cities to other communities in order to cope with stretched resources. A reception centre will be established in Cornwall, Ont. to identify other destinations for newcomers. "You can't have a reception centre without having places to send people to," Hussen said. "And Toronto is already talking about how they're reaching capacity." Conservative immigration critic Michelle Rempel called the cash announcement a "Band-aid" solution and predicted that money requirements for housing, health care and other social costs will continue to climb as the flow of asylum seekers crossing into Canada from the U.S. continues. "What we've heard today is an abdication of responsibility to manage our border and our asylum claims system effectively," she said. Rempel repeated her demand that the government apply the Safe Third Country Agreement (STCA) to the entire border. She said declaring the whole border an official crossing would close the loophole that's driving irregular border-crossings. The STCA requires asylum seekers to make their claim in the first 'safe' country they arrive in, unless they qualify for an exception spelled out in the agreement. But the agreement applies only to claimants trying to enter at official land border crossings, by train or at airports — which is why some are making the trek into Canada by foot outside official crossing points. Border talks with the U.S.
"It's not fair to have to talk about shuffling people across the country because one province has an issue or another," she said. "That is not how planned migration works, that is not how humanitarian immigration should be dealt with or supported in this country." The government has rejected the Conservative proposal repeatedly in past, insisting it would push people to more remote and dangerous crossing points and undermine border security. 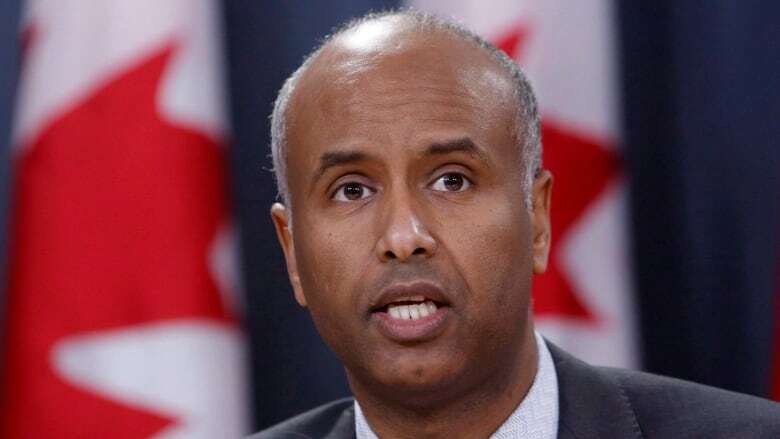 But this week, Hussen suggested the idea of modernizing the agreement so that it applies to asylum seekers crossing between official ports of entry will be part of his discussions with U.S. Homeland Security Secretary Kirstjen Nielsen in the coming weeks. "The agreement does not apply between ports of entry, so the discussions would revolve around making sure that we modernize the agreement in a way that makes it applicable between ports of entry," Hussen said in an interview with host Vassy Kapelos on CBC News Network's Power & Politics Thursday. Asked about possible changes today, Hussen said no formal negotiations are underway, but he would like to see the 14-year-old agreement modernized to take into consideration technological advances, such as biometrics, and information-sharing. Toronto Mayor John Tory issued a statement calling the $50 million "a start towards the federal government meeting its responsibilities to cities." Toronto alone expects to incur $64.5 million by the end of 2018 in direct costs related to providing motel housing to refugee claimants, and anticipates spending another $6.3 million on emergency contingency sites, he said. "Our city has a long history of welcoming refugees and we continue to support that approach, but we have been clear that Toronto can no longer absorb the cost and impact of the increasing numbers of refugee claimants coming into the country at this time," Tory said. "I look forward to continuing discussions with our federal and provincial partners about how to further address this ongoing issue." City of Toronto spokeswoman Patricia Anderson said Centennial College, which on May 24 opened accommodation mostly suitable for families, has capacity for up to 400 people. Humber College has capacity for up to 400 people, mostly for single refugee claimants. The city is now transporting people there and will continue to do so until it is full. Most recent statistics show there are 2,779 refugee claimants in Toronto's shelter system, including hotel and motel programs specifically serving refugee claimants. They represent nearly 42 per cent of the entire shelter population.